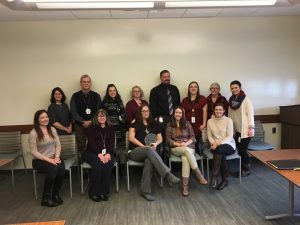 Human Services Center (HSC) was recognized with an exceptional provider award by Value Behavioral Health- PA at their Annual Provider Appreciation Breakfast on Friday, December 1, 2017. The staff of Human Services Center received recognition for their use of an open access model for intakes to begin services. HSC began the use of walk-in intakes in September, 2016 in order to be more responsive to those who are ready to begin services without delaying the process of scheduling appointments that were a week or more in the future. Approximately 50 % of the previously scheduled intake appointments were missed while HSC staff resources were diverted to prepare for those appointments. HSC staff from the Diagnostic Assessment Center, Outpatient Therapy, Crisis and business office all work together to triage those individuals and families who walk in Monday through Friday between 8:30 a.m. and 9:00 a.m. to provide an immediate face-to-face initial assessment, identification of individual needs and subsequent actions that may include an intake assessment with a therapist who will provide ongoing treatment for continuity of care purposes. Individuals and families who present for walk in intakes should plan to be at HSC for approximately two hours. HSC recognizes that it is often difficult to ask for help so the opportunity to come directly to the agency without scheduling helps those who may be struggling with transportation or other support issues. Referral sources report that it is helpful for care coordination as part of hospital discharge planning.